On the 19th June 2017, Father and Son cyclists Chris & Barry Montague from Dungannon bravely decided to tackle a gruelling Land's End to John O'Groats cycle on two wheels, the father and son duo cycle was organised and completed in honour of their late cousin Charles Montague and the duo decided to also make it a fundraiser in aid of the suicide prevention charity PIPS Newry & Mourne. Not only did Chris and Barry cycle the distance but they did it carrying their camping kits and equipment and with no support Vehicle assisting them. The epic journey took 10 days to cycle the 1000+ miles and between them they raised £1611.35, Both Chris and Barry would like to thank everyone who supported them and cheered them on with a special thanks to their cousin Estelle Hamill, who was especially supportive. They would also like to thank Barry's partner, Maria Ludlow and Laura Montague daughter/sister for delivering and collecting them at each end. 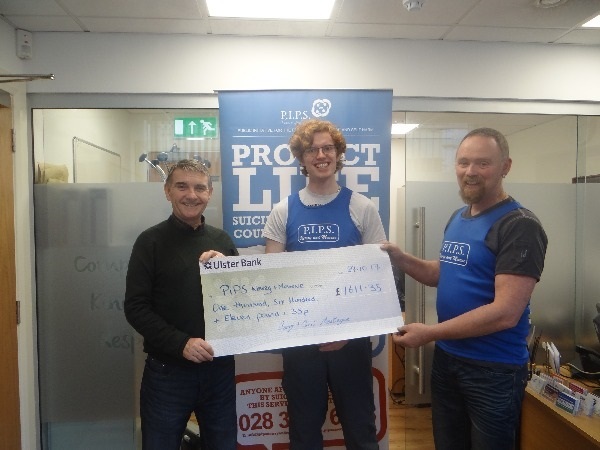 PIPS Newry & Mourne would also like to thank Chris, Barry and everyone involved in this very kind donation.